We are pleased to invite you to a very special International Human Rights Day celebration at the United Nations, focusing on combatting homophobia, transphobia, and imposed gender binaries in sports. The event will feature a panel of human rights experts as well as former and current sports stars. We anticipate a lively discussion on a topic that only recently has become visible in mainstream media and politics. For short bios of the civil society speakers on the panel, see below. call Sarah Bennett at 212.430.6033 to RSVP before 1pm Friday 12/6. Watch Live Online If you can't join us in person, tune in to http://webtv.un.org for a live webcast of the event. To see the broadcast time in your local time, visit the event page at Time and Date. 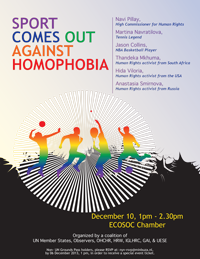 The International Gay and Lesbian Human Rights Commission (IGLHRC) is a proud co-sponsor of this annual event. We are particularly delighted this year to bring 25+ human rights defenders to the event from across the globe. We very much hope you can come too, to meet with colleagues and friends, and to mark with your presence that human rights are for everyone, everywhere. Itumeleng “Tumi” Thandeka Mkhuma, Johannesburg, was born in the Eastrand, Gauteng, South Africa. She grew up in Katlehong. She is a young lesbian, an activist and a survivor of violence and a fun loving queer-being. Tumi has volunteered as a photographer at FEW (Forum for the Empowerment of Women), of which most of her work has been used within FEW publications, she is a committed sport activist, a member of the Chosen Few soccer team and she positively views her life through her activism. Tumi has found a space within Iranti-org, and focuses on media documentation (photography, video and audio). Tumi produces podcasts for Iranti-org and actively develops the Iranti-org outreach programmes. Anastasia Smirnova, St Petersburg, coordinator of the coalition of LGBT organizations in the Olympics advocacy campaign. Born in 1986, she has long been involved in LGBT activism on the national and international levels. She holds a ‘Specialist’ degree in Linguistics and Cross-Cultural Communication from St Petersburg State University, and a M.A. in Sociology from the European University in St Petersburg. Hida Viloria, San Francisco, is Chairperson of the Organization Intersex International (OII), and the Director of OII-USA. She has educated extensively on the topic of intersex as a writer (The Advocate, The American Journal of Bioethics, CNN.com…), consultant (International Olympics Committee, UN Human Rights Office), television guest (“20/20,” Oprah…), lecturer, and in the documentary films Hermaphrodites Speak, Gendernauts, One in 2000, and Intersexion. She has a degree in Gender and Sexuality with high honors from U.C. Berkeley, and writes about intersex for The Global Herald and in her blog Intersex and Out.